We have always wanted to make a gingerbread house for Christmas and have never gotten around to it. 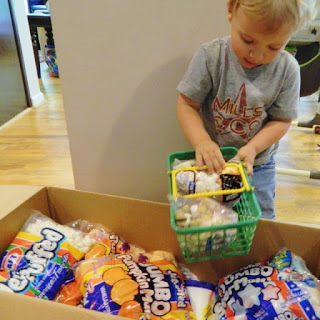 We received a huge box from Jet-Puffed Marshmallows and thought why wait until Christmas to make a edible fun house. 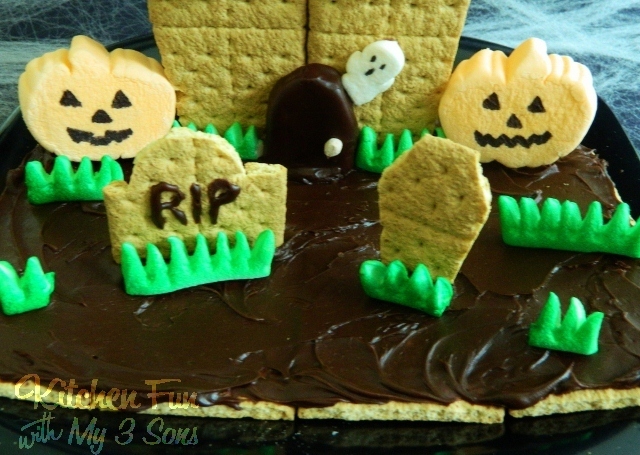 Our big box of goodies was full of fun Halloween marshmallows that would be perfect for a House of Spooky S’mores! 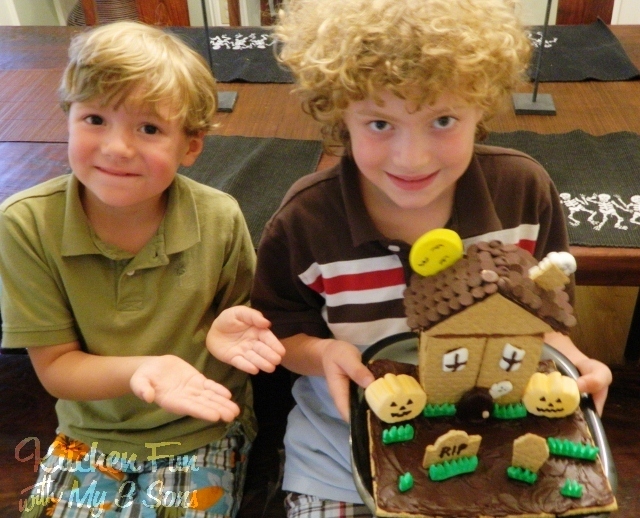 Our entire s’mores house is made with graham crackers, chocolate, and marshmallows. This was so fun to make with my boys and they LOVED it! We would like to start off by letting you know how easy it is to cut graham crackers with kitchen scissors. We do this all of the time. We have made a ton of s’mores pops and it works great. Don’t be afraid of breaking them..just make sure to use good and sharp kitchen scissors! We use cookie cutters on them as well! Take 2 of the Honey Maid graham crackers and lay them side by side (touching) on wax paper with the back side facing up. Squeeze chocolate cookie frosting in the middle and let dry. Do the same for 2 more. When they are set and dry prop them up with something tall behind them (like a thick book or tall vase. Take 2 more graham crackers and squeeze frosting on the edges. Prop them up on the sides to set with the front and back. Place a juice glass or something thing and tall in the middle. Then cut another graham cracker into a triangle using kitchen scissors. Squeeze frosting on the edges and place on front and back tops. The glass in the middle with help prop it up if it tilts over a bit. The cookie frosting is great because it dries very quickly. Lay another graham cracker on top (the roof) and measure how much you will need. Cut off any extra with your kitchen scissors. 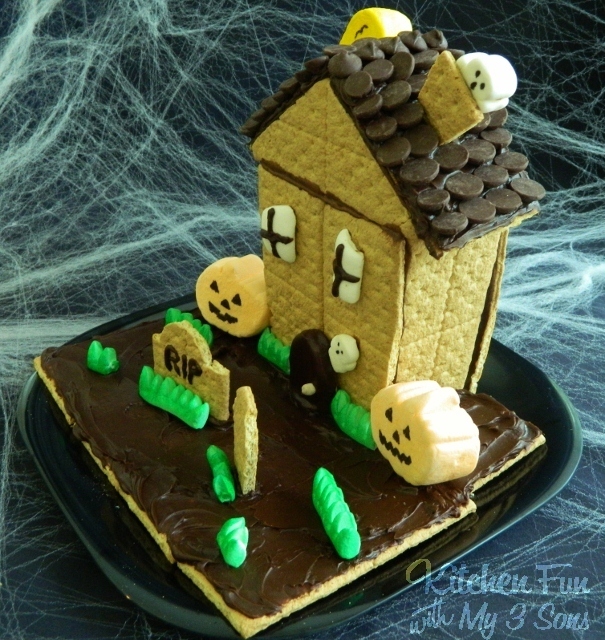 Save your scraps to make the chimney and tomb stones. Let everything dry. 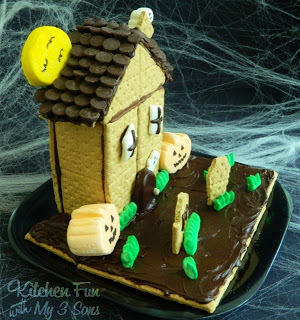 We placed our house on a plate and placed graham crackers around the house (for the yard). We frosted the yard & roof with Pillsbury chocolate forsting. 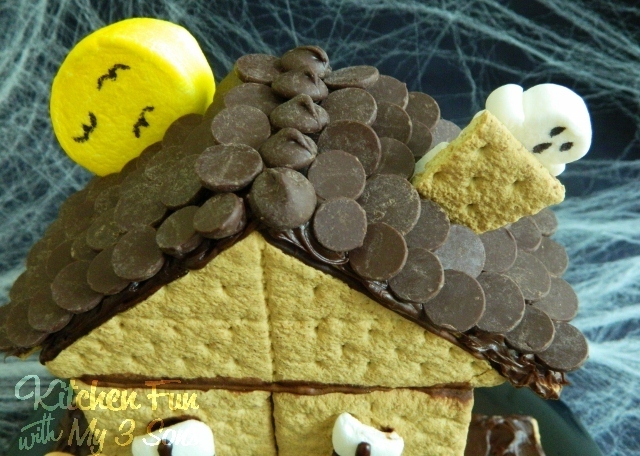 We place jumbo chocolate chips upside down on the roof to look like shingles. We decorated our marshmallows using edible markers and Wilton green color spray. We made the grass by cutting the stacker marshmallows in half. Then we snipped out small triangles from the sides with our scissors. Place them on waxed paper and spray with the green color spray…let dry. Dry faces on the ghosts and pumpkins using the black edible marker. We cut a jumbo marshamallow in half and colored it yellow with yellow edible marker (for the spooky moon). We then made the bats with black edible marker. We cut out the door and windows from the stacker marshmallows. We decorated with the chocolate cookie frosting. We used a mashmallow bit for the door knob. We attached everything on using the cookie frosting. Here is a right side view…. Here is a close up of the yard…. Here are my two oldest little helpers. 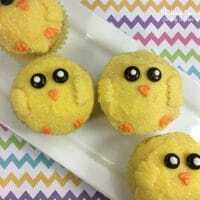 They are awesome and this was so much fun to make with them! We want to give a BIG thanks to Jet-Puffed Marshmallows and we plan on making a lot more fun marshmallow treats! You can check out Jet-Puffed Marshmallows on Facebook where you will get so many fun food ideas and recipes! 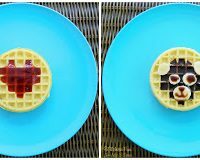 The New Eggo Drizzlers Review! 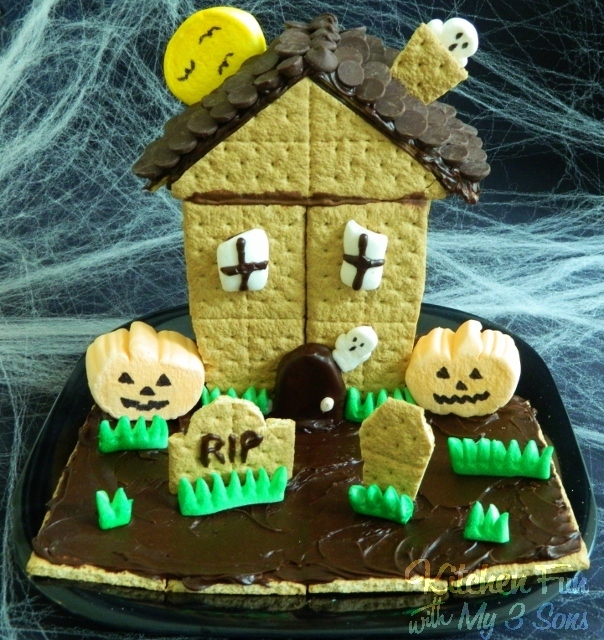 I was just thinking about making some spooky houses too! I can't wait until Christmas. I'm wondering too. How did you get hooked up with the Mallows? I'd love some more info on how you are connecting with brands! Great job Jill. The yellow moon looks great as does the entire house. What a fun addition this would make to any Halloween party. This is so cute! We make gingerbread houses every year for Christmas so I know my boys would love to make this! 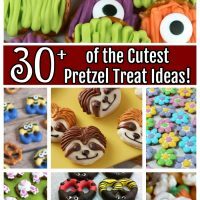 I'm pinning this so I can remember to have the kids make these at a Halloween party. Activity and treat! Perfect! That IS a big box of marshmallows!!! I think this is spectacular!!! I think your boys approve!! So cute, what a great idea! How cute is this! I would love for you to share this post and any other Fall related post you have, at this week's It's Fall Y'all ~ Linky Party. Hope to see you there! Love this, a lot! I'm featuring you today at 11:30 on my Facebook wall! Thank you so much for linking it up as well as your other cute ideas in The Mommy Club! You totally rock! What a really great idea! 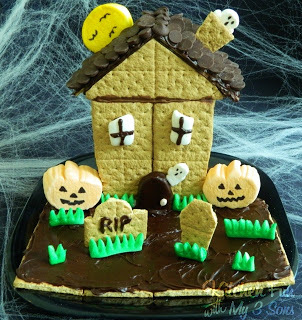 We still have to get round to making a gingerbread house too. Thanks so much for sharing these on the Mrs – I've featured them this week! How cute! I bet the boys had a blast with you doing this! Now that's a box filled with goodies! Thanks so much for sharing at Mom On Timeout!